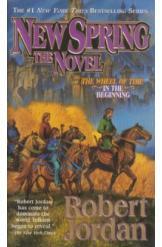 New Spring the Novel, the Wheel of Time in the Beginning by Robert Jordan Sci Fi. Paperback, in excellent condition, 359 pages, all pages intact. The story has political intrigue, powerful characters, dangerous magic and dangerous secrets.